Welcome to the Dakotah Winery, a Central Florida spiritual, romantic experience. 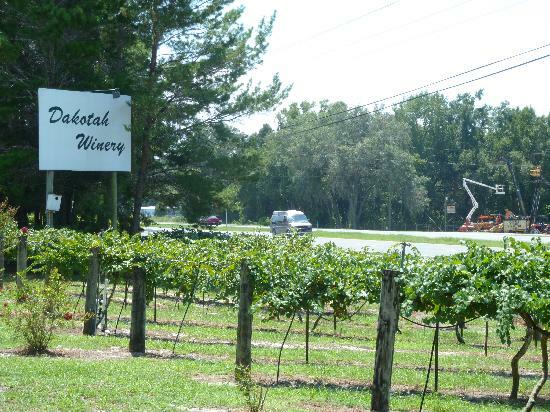 Dakotah is a Florida family winery, operated by its founder Dr. Max Rittgers and his son Rob. Max established the vineyard in 1985 with a planting of 200 muscadine grapevines. The first grapes produced were sold on-site from a board across two five-gallon buckets. Today, Dakotah Winery grows its grapes on 17 acres. Visitors enjoy participating in a free wine tasting in our comfortable tasting room. Adjoining it is our new addition, an underground wine cellar. Guests are encouraged to relax under our large arbor/picnic area overlooking the vineyards. On the deck behind the tasting room, guests can view our Wood Duck sanctuary and pond with hundreds of Japanese Koi. DakotahWinery is a place of peace and a haven for both humans and waterfowl.